Originally, this project started as a simple "Choose Your Own Adventure" type of game. However, I started experimenting with visual novel programs until I switched to RPG Maker. Since then, I've been working on this game project which I titled "The Outsider Who Loved Gensokyo". It's a rather (very) simple project with an emphasis on trying to make a plot while remaining loyal to the Touhou canon as much as possible while attempting to expand on it a little. My current goal is to separate the game in two different style of gameplay. The game is currently in demo phase and there's still a lot to do but I'd say I've been doing some decent progress so far. The current content of the game may take a few hours to complete especially if all dialogue sequences are read. An outsider is lured into Gensokyo where he becomes fascinated by the strange sights and people that he would never see in his world. He decides that he will explore Gensokyo but he's warned several times that this is too dangerous. Ultimately, he either listens to these warnings and lives his life among the people of Gensokyo and the game follows a visual novel style of gameplay or he goes to meet Yukari who lured him in Gensokyo. If the latter happens, she reveals to him that he is the new emissary of Gensokyo. Every 200 years, an outsider is chosen in the outside world and he or she brings gifts to the important people of Gensokyo and usually returns to their world to spread the legends of the youkai while in exchange, the youkai will make sure that no incident within Gensokyo will ever put the outside world in danger. The protagonist is an exception. He has no relation to the former emissaries but Yukari and Ran believes that he was chosen by Gensokyo itself. The emissary of a new generation, the outsider is granted a treasure that will protect him from the dangers of Gensokyo whenever he does not battle. 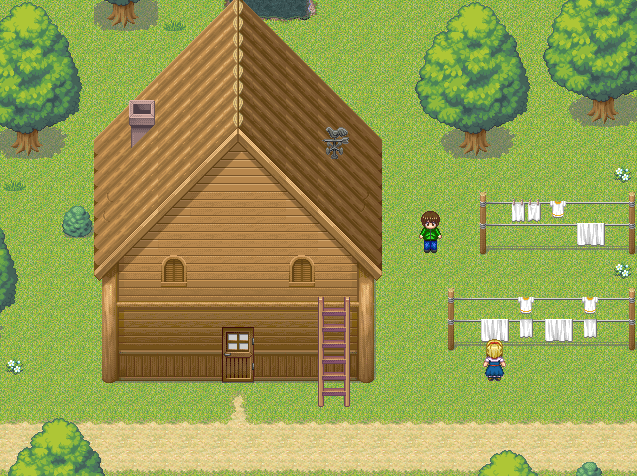 This side of the story focuses on the interaction of the outsider with the people of Gensokyo as he travels in this RPG-styled game. The RPG route as stated above focuses on the interaction of the protagonist with the characters of the Touhou series. It is possible to explore the regions of Gensokyo alone where bosses are easier or with the characters where the bosses fights normally. The character can improve his relationship with some of the characters during certain events, by exploring certain regions and various other methods. While it is possible to reach an ending with various characters, the RPG route technically has a few primary "heroines" in the sense that they have a little more story and interaction between them and the protagonist since there is no plan to have a visual novel route for them. While there is decision points that will improve or decrease the relationship value with the characters, there's also events that will decide what sort of ending you'll get if you finish the main plot. There's also plans for a special route that stars the Touhou characters themselves if the worst ending is reached. As pictured above, the fighting is darn simplistic, following a standard type of gameplay for the time being. The game is meant to be possible to play on solo or as a party of four characters. On solo, usually, the bosses will be easier than their "party" version where they do not use spells that could make the battle unwinnable. The party version of the fights has the boss use their better abilities and their stats are superior as well. Even though the RPG route involves fights, the game still has an emphasis on the plot and dialogue sequences. The RPG plot is meant to explain why the protagonist was the person who became the emissary, the history of emissaries and find the one who is behind all the events of the game. The list of characters that can be recruited is at the bottom of this post. Not much to say here really. There's a variety of routes available depending on your decisions. Eventually, through these decisions, the plot will focus on the heroine(s) of the route that has been reached. There's a variety of endings that can be attained including the usual good endings, the bad ones and of course the ones where the game is ending abruptly via brutal, silly or "dark" ways. The list of the routes I have planned are the the bottom of this post. Worthy of note is that there's many routes that I have planned. This may seem unrealistic but the thing is that the routes are not planned to be things that list 7 hours or so. They're meant as short stories that may last a few hours. I've been working solo on this project so far and I don't expect it to become different at any point. However, I need to point out a few things about the project for the time being. If I put an * next to one of these points, these issues are thing I intend to take care of or improve at a later date. The idea is to make a simple project and not some sort of masterpiece but I still *try* to get to a certain level of good quality. - I have currently limited in resources in term of enemy sprites and map layouts. This is pretty easy to notice when seeing the houses or character sprites from Touhoumon. - Aya and Momiji has a part of their visual novel route started but it's a very, very early stage of it. To proceed to the RPG route, decide to explore Gensokyo when prompted at Yukari's house. - Romance is possible in the game. I'm keeping mature content out of the game. However, I haven't decided if I should avoid implication of adult intercourses or if it's fine to slip in a few without being explicit. - Right now, I focus on the RPG plot and it's main plot. There is a few relationship events in the game at the moment but many are planned to be added when the main plot has been taken care of. - Constructive feedback both positive and negative is EXTREMELY welcome. This can range from glitches in the game, things I omitted such as proper transition from an area to another, oddities with objects, themes brought in the game within the dialogues, inconsistencies with the canon and the list just goes on. In short, you're more than welcome to give me any feedback if you take a look at the game or even try it. This is the link for the demo of the game. This is version 2.6 which starts from the beginning of the game all the way to the first phase of Youkai Mountain and the surroundings of Eientei. The next phase of the demo is Eientei (Featuring Eientei/lunarians characters) and Youkai Mountain phase 2 (featuring the Aki sisters and Hina). Please notify me if the game doesn't work for some reason so I can fix the game ASAP. These links are recorded footage of the game, showing all the current content of the demos. The first one includes the intro of the game but the early sequences has no portraits and the protagonist has the old sprite before it was changed while the second link skips the intro and has all the bits where the portraits are shown during the early bits of the game and the protagonist has his new sprite . There's over 30 parts at the moment but I'll just post these two links. Characters with an * near their name are already recruitable. Those with an * and a ~ are recruitable but their skills will be added in version 2.7. If the characters has a "/" attaching them to another character, this means that these characters shares the same plot together. Those with a X next to their name are routes I'd consider if I had their sprite for RPG Maker XP. This seems really interesting. Would you rather have feedback PMed to you or posted in this thread? Well, I'd say either is fine really. Posting it on the thread could be helpful for future references especially if it's about technical aspects of the game. However, if you feel more comfortable with PM, please go ahead with that. Some minor inconveniences and proofreading. Feel free to tell me if you'd rather not have me attempt to proofread. - A file explaining the controls would be helpful. It'd cut down on a minor bit of frustration on the player's end when first starting the game. - Being able to hold down a button to skip dialogue would help. Especially for replaying sections. - Minor: The music cutting off suddenly at the end of the opening cutscene is fairly jarring. Having it fade away makes for a smoother experience. - The and makes the whole sentence awkwardly long. You can safely break it up into two sentences. - Should be "few" instead of "little". - "pass" instead of "passes"
- "Utmost" instead of "Outmost"
- "from having" instead of "to have"
- "want" instead of "wants"
Nah, I appreciate your effort to proofread this. I've been planning to fix these mistakes at some point but I'll probably miss a few no matter how many times I check. As for holding a button to skip, that's something I'd like to do but I'm not sure if I can add this to the game. Perhaps there's a script somewhere I can use for that or I might have overlooked an option in RPG Maker XP for it. "The and makes the whole sentence awkwardly long. You can safely break it up into two sentences." Thanks a lot for the help, I'll take care of these mistakes next time I work on the project. Honestly, that one is one I'm less certain about the more I think about it. When I initially read it, I felt that the sentences joined together by the "and" on the second line would've worked better if you slightly changed the wording of the second part and made them two separate sentences. Just use your own judgement. I don't know if RPG Maker is to blame for this, but try to leave the first letter of a word of a text block un-capitalized if it's continuing a sentence from a previous block. It makes it clearer that the sentence from before is continuing. Nope, I admit that it's my fault. I agree though, I should fix that as well. I'll take care of that a bit later or at least once in a while as I work on the current project so I can keep myself as motivated as possible although motivation has rarely been an issue. Move the "Level Up!" message from the character status bar to a message. Level ups are something to be happy about, I doubt many people would mind hitting the confirmation button an extra time over that sort of news. Place a comma before someone's name when you're ending a sentence by referring to them by name.. "Thank you, [main character]" for example. Use a comma before a "but" when using it to join two independent ideas. In general, place a comma before a conjunction (and, or, but) if you can feasibly replace the conjunction with a period and still have the two sentences make sense. Random Google on the subject got me this for examples. "It's" is a contraction of of "it is". "Its" is the possessive. English is weird like that. "exploring" instead of "explorating" Edit: Just found out that explorating is actually a word. You can leave it if you want. It is considered obsolete though, so keep that in mind. Missing a "be" at the start of the line. "that" instead of "this" at the end of the second line. "is" instead of "were". Aya's info is still good after all. Some of the mechanics in the game are stuff I can't really control but I'll try to fix it. As for the erratic difficulty you mentioned, the part in the sunflower field was rather intentional but I guess it would make more sense if I modified the enemies to be more on par with the previous ones. I've been having a bit of a concern about this because the game is meant to be a bit non-linear although it has event flags that gives access to certain areas. However, many areas in the game are optional and technically aren't necessary to complete such as the forest of magic, the mineral cave, the sunflower field or all the region that leads to Eientei. Is it ok if i did a video on this? ;p and is the demo link in the OP the most updated? Oh, please go ahead if you wish. It's indeed the latest version right now. Just as a note in case you're insistent on keeping characterization canon, I'm fairly certain that Keine is actually pro-segregation between humans and youkai and straight up refuses to teach youkai. Her dragging in youkai "children" such as Daiyousei is a fanon thing. That said, like pretty much the rest of the alternate fanon-characterization, I doubt anyone is going to care if you leave it in. Yeah, it's fair to assume she's pro-segregation. I'm also aware that it's fanon but after reading some Touhou official materials, characters seems to be a little more open about a few things and some of Akyu's information gets proven wrong at times. I've been slowing down on the project because of this since Eientei is the next part I'm working on and I thought I'd read all of Cage in Lunatic Runagate. In this case, Keine's action was mostly just for laughs seeing how in canon, her efforts to educate children seems to have mixed results. Reading CiLR kind of changed my perspective on the RPG project since I got to learn a lot more about some characters. I still have to finish the manga books with Sunny Milk, Luna Child and Star Sapphire which has a lot of interesting cameos as well. The one I'm not sure if it's worthwhile to go through before continuing is the stories that features Renko and Maribel. While I do plan to read them because of their role in the game, I'm not sure if there's any additional info about characters in Gensokyo to be found there. Luna Child seems to be stuck spamming Accelerate during the fight with the Three Fairies. She used an attack exactly one time over the course of the entire fight. Extraneous "n" at the end of "have"
Missing parentheses at the start of the line. Should be "that is in" instead of "this is". The "If" at the start of the second line should be lower case. Should be "haven't" instead of "never"
Missing "will" at the start of the line. "this" should be "that". Having "much of" and "big" at the same time is redundant. I recommend changing it to "big of a threat" or getting rid of the "big" while leaving the rest as is. Edit: "equipment" in the status screen should be capitalized to match the rest of the categories. The thing with Luna Child is kind of intentional and that's even more the case with the solo version of the fight with her/them. As for a female option, I've been considering it but since there's the possibility to "romance" some of the characters, this means that either I'm doing something that is purely fanon or I need to write new dialogues for many portions of the game. If I was to do the latter, I'd have to do it later when my current goal is completed. and lastly a request can you make koishi or utsuho playable characters in a maybe distant future? I'll try to fix these glitches and errors. It seems like even though I test some scenes several times, some stuff somehow manages to pass by which is why I appreciate any help from people who tries the game. As for Koishi and Utsuho, I'll see if I can make it possible when I get to the point of the game where they make an appearance. What version of RPG Maker are you using to make this? Do you plane to make your own UI for the game? Hi, thanks for letting me know. I think I fixed that but I'll still take a look just too make sure. As for your questions, I'm using RPG Maker XP since it's the first one I found Touhou sprites to use although I did see VX had some at some point. I decided to stick with XP because I prefer the visual style. I do try to work as much as I can but due to the fact I've been busy with work and various other things, I can't work as much as I used to. I got a little more free time now though so I'm able to work a few hours during a few days of the week. As for the latter, I would... if I could since my knowledge of stuff like that and certain things in RPG Maker is limited to a degree. I hear ya, I'm currently using VX ace myself. Do you know where to find the images in the RPGM folder? If so then you could find the Window.png and edit that and re-upload it to RPGM. But that is to say if it's similar to VX anyway, I can find mine in the rtp/Graphics/system folders. But I'm with you on the limited knowledge thing, I've worked on UI's before but never tried to make my own, with limited space on the sprite sheet and knows how to give it good "theme" is challenging, no idea how to make a "Japanese style" UI myself. Alright I've put a good bit of hours into the demo so far (14 I believe.) and there is a lot I need to talk about. 1. My biggest issue is how long it takes to get to places. This could be resolved by making a world map for the bland and simple areas and make mini dungeons for others. I.E: Misty lake, forest of magic, and a few others. Either that or have some way of allowing me to get from point a to point b quickly. 2. Ties into my first reason but having only 3 characters join you and once they are let go and re joined and are permanently seems like a hassle that doesn't need to be there. If I have all three slots filled and lets say I unlock Chen to use, well if I want to get rid of Alice I have to walk all the way back through the forest of magic just to taker her out of my party and then walk all the way back to Chen again. And lets say later down the line I would like to use Alice again, well I'd really have to think about it because she would then become a permanent member of my team. I do have another issue but it is more related the the next one. 3. Boss battles. I like the challenge but I'm stuck on a few gauntlets where I just use up a huge amount of my MP or run out of healing items when I get to the final fight. I'm currently stuck on the Aya and Momii gauntlet and the Mystia - Moku fight, and I stand no chance, I've grinded to reach a level where the area enemies are no problem but the bosses in said area are still a tough fight. You said how you have it made where the fights are easier solo but there are a few issues I see with this and feel it's needs some re-balancing. Making the boss fights easy solo would mean that to progress better you would always want to travel alone, which make random encounters harder, and there would be no need of wanting partners. The other issue is that since after the second recruitment the characters are permanently on your team then if you are having issues with boss fights you can't get rid of your allies and the only way to beat them is to grind for a long time to get strong enough. Its seems counter intuitive really. Those are my 3 biggest issues. I love what I've played so far and the story have me very interested but when the mechanics are like this... well I work a full time job and I just don't have the time to be grinding for a few hours a day before continuing the story. Egoraptor said it best: it's like walking back and fourth 3 times in your house before turning a page in a book. I feel these mechanics can be improved upon and the game will really shine. Also just a nip pick really but the path to the Hakurei Shrine has three screens for it, well the one with the stairs seems fine until you reach the second screen and the grass is vastly different, also you start on a pathway when the screen before had no indication of a pathway, then finally the last screen has the Hakurei Shrine in it it's self but the grass returns to the first screens pallet. Also I found that I cannot progress Yuuka's and Patchouli's plots even though I have the Bamboo for Pache and the gem for Yuuka, I feel I can only get through this if I can beat those bosses I mentioned above. I went to Pache about three times after continuing the story a bit in other areas and having to walk all the way up to the SDM really made me wish for a fast travel or something. Thanks for the post. This "nitpicking" is highly appreciated since it gives me an idea of flaws that needs to be fixed so I appreciate you being forward about it. 1. Travel is a serious issue I've noticed while playing the game to test it. Just finding Chen's cat and walking back to her to get her to join is a pain but Yuuka's quests are a nightmare of endless backtracking especially considering she has more quests coming up. I was thinking of adding something like an item early in the game that unlocks warp zones or something to enable easier access as you travel further like let's say you reach Marisa's house and then you get access to a new warp area that allows you to go to previous area you explored. Eitherway, I fully agree. 2. The party member issue is more in term of my own limitations so far at the moment unfortunately. I'd be more than happy to have a system that makes it much easier to deal with party member recruitment. Someone suggested having Suika's ability to gather people or do something like Final Fantasy VI which I'd love to do but again, I'd need to figure out how to pull it off. 3. In term of boss battles, do you have a general idea of what level you have when you reach them? I'd like to know so I can get a general idea of what level you are when you reach Momiji/Aya or Mystia/Mokou (the latter were designed to be harder). I admit the fact that Mokou having no weakness due to "Immortal Flame" gimmick might make the fight way too tedious. What did you think of Sakuya by the way? Was her spell OverDrive too powerful in your opinion? Did you feel that certain specific bosses were too hard or cheap aside for those you mentioned? As for solo vs. party, using a party in most boss battles usually "rewards" via more plot and relationship events compared to the easier fights on solo but solo fights sometimes demand more preparation via equipment. They events are not all there yet but they'll be added later. The next update will also bring stronger abilities to each party members while giving a full skill set for Sakuya and Patchouli along some characters like Murasa and Keine will be balanced to be stronger. When it comes to Reimu's shrine, it's because the tilesets that have a more eastern feel clash with the ones from RPG Maker XP. On top of that, some of them lack basic stuff like ground details, little in term of ground you walk on variety (grass, road, etc.). I've been searching high and low for good quality stuff but much to my surprise, it seems to be a bit hard to even find new content for maps. Still, I'll try to fix that in some way because it does stick out. The road after the stairs has been added. As for Yuuka and Patchouli, do you mean you literally can't complete their quest after finding the requested item? The gem might be due to the fact that at the end of the third official update, Aya and Momiji had to be defeated before having a final boss fight with Yuuka (exclusive to version 3) but if that's still here, I'll fix it to make it possible to complete as soon as you get it. Patchouli should also be possible to unlock immediately once you get the bamboo piece. I'll also look into it. Granted, it also depends on which version you downloaded since I've made some modifications since then to fix some content. Thanks for your post. I highly appreciate your help and I'm more than open to suggestions or to be told about mistakes or issues in the game. 1. It could be as simple as say a scroll that allows the use of a yukari gap for fast travel. A great example I can think of is the Gap world used in Touhou Mother, where the warp points are visible on what could look like a mini map of the world. 3. The protagonist is currently lvl 28. The way those two boss fights felt it did seem like Mystia/Moku was harder and I felt like I should finish the Aya fight first. The Aya fight wasn't so bad but once I got to the third boss fight I was just running out of stuff or wasn't able to heal enough from the damage I was taking. (I still enjoyed the challenge but just felt irritated that I'd have to grind some more even though the enemies in the area pose no problem.) To be fair it is Moku, those who know what Touhou is would see it as a Immortal EX boss, I'd expect her to be hard. I'm sorry but you'll have to remind me what over drive did again, I did that fight a few weeks ago. I enjoyed that fight really, the sudden stop followed up by the dialog and the new fight really gave the battle a "this is it!" feel to it, she got me once but after that I managed to defeat her, it was a very balanced challenge I feel. Off the top of my head I can't think of any, the fights felt balanced in that if I'm still having trouble with the random encounters then I'm not ready for the boss yet. What I will say is a very good design is the fact that all the boss fights happened on for after the one tile path, which made me cautious and saved a lot. OK, that would explain why Marisa and Alice talked with each other before Alice's fight, if I didn't have Marisa then that dialog would never had happened. The relationship points is something I have yet to experience after a battle, it could be that I hadn't used the right character for the fight to meet those conditions yet. Awesome, sorry about asking something small like that. I downloaded the file that was in the OP at the time, but I have no idea what version I'm using. The title and the Read me file don't say anything on what version I'm using. The moment I picked up the Bamboo shoot I went straight to Patchouli but nothing happened. I might as well ask this here too but how can I recruit Reimu? I assumed it had to do with her donation box so I've been donating every time I visit her (which is like a quarter of my total earnings. ), it could be that I'm on a older version where I can't get Reimu but I'm not very sure. 1. I really like that idea. It would make all of this so much easier and straightforward. I was considering the gaps too but because of the nature of the story and the character, perhaps an item that allows that to work could excuse using gaps? 3. 28? Ouch, I guess I need to rebalance some of them then. The fight with Aya/Momiji was set for around level 20ish (the idea is to focus one of them at once) while Mystia/Mokou would be at 25. I did them all at these level after testing them a few times but it's true that items are an issue. Is Rinnosuke working properly too? If you trigger certain events, the item rank goes up and I believe that Momiji/Aya indeed grants one point which unlocks Maple Melonpan that grants 400 HP if you visited. It'll be possible to get more points differently such as meeting the Eientei cast or reaching Muenzuka. As for OverDrive, it's that spell Sakuya cast when her HP gets low and everyone is stopped (ignores resistances) for 5 turns so she attacks consecutively during those turns. 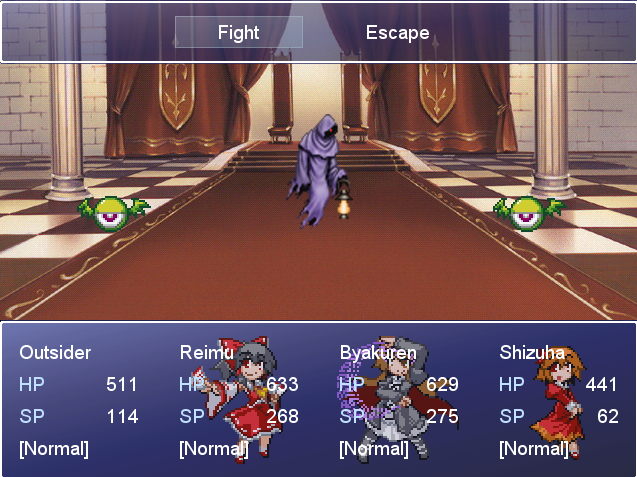 Mysteriously, Reimu seems to be stopped for a whopping 6 turns instead of 5. I might make some guide at some point but if you're interested, these events happens if you have the characters in your party or if you performed certain actions. - Meeting Meiling with Marisa in the party has her join in the conversation. It's possible to get relationship points with Marisa here. - Talking with Remilia several times after meeting her enables a bit that allows you to increase or decrease your relationship with her. One of the two opens a gag sequence. - Bringing the journal to Patchouli and then bringing it to Remilia allows a chance to increase or decrease the relationship with her. - If you bring the pocket watch to Sakuya and you increase Remilia's relationship in the journal event, she'll offer to join you. If you upset Remilia, she sends you on another quest forcing you to recruit her much later (having to go past Yuuka and reach Nameless Hill). 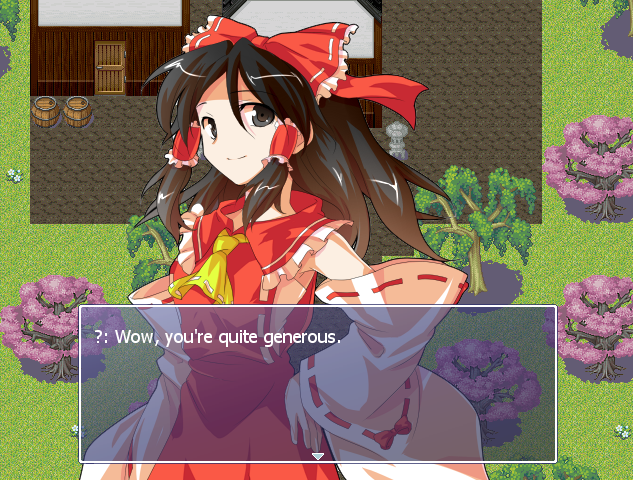 Right now it costs 10k in donation to have Reimu join the party but I'm thinking of lowering it down to 5k. 1. Well I gave it some thought and walking to the destination is good to build your parties strength and to find the items hidden around (I think I have a weird sense for chests cause I have yet to miss one yet, I enter a area and just know there is a chest there. ), what could be done in story wise since you are establishing a connection with the characters Yukari can give you an item that will open a fast travel gap once you have fulfilled that characters needs. An example could be that once you are able to get Marisa you get a warp point to her house, which helps you get closer to the SDM for the rest of the characters there and then unlock a warp point in certain areas in the SDM. This fulfills the sense of adventure and the exp needed to get stronger for future battles and rewards you for your efforts by a fast travel point. 2. If you were using vx ace I'd direct you to a dude named Yanfly who has redone the whole system and added a cool party mode in and out of battle. But there are ways to do that in a creative way then using custom scripts, which do help but still. 3. I might have a earlier version then, which I went and re-downloaded and will play to see if that is the problem. Kourindo works fine too in my version. OK now I remember, that was a hard hit to my party IIRC, killed one and almost wiped out the rest but I was able to recover in time. Like I said before, fun but challenging fight. Yeah, I must have a earlier version, Ran was my first character recruited and I never got any interaction from her. Oh 10k, I feel like I just need a few more to fulfill that requirement. I'll leave that up to you, thinking about it it might be a good idea cause IIRC I had no where enough money to get Reimu around the first time I met mystia, at least from what I done by my choices, others may have had no issue. I'm actually using RPG Maker XP instead of VX Ace. As for Ran, did you have Marisa in your party? If so, then I might need to fix the event. Yes Marisa was in the party. I think I fixed that issue since the last upload but thanks, I'll double-check again just to make sure it works properly. A lot of events with Patchouli seems to have been problematic so I hope I can fix all that. I'll playtest the various scenarios again to make sure it's more stable.